MARIONETTES that will perform all sorts of amazing tricks can be made without difficulty, once the secret of their construction is understood. Ball tossing, for instance, is a simple trick. Then there is the skeleton that disjoints his limbs and throws his head into the air, and the dwarf who grows into a giant. Various adventures of Alice in Wonderland also can be portrayed. For ball tossing, drill a hole through a wooden ball and run both strings through it, passing the ends through the palms of the marionette’s hands and knotting the ends, as in Fig. 1 of the drawings. Tie the other ends to an extra 12-in. stick. By tilting the ends of the stick alternately, the ball will fly up and down. There is less friction if the string is waxed and the hole in the ball is burned through with a red-hot wire, instead of being drilled. ries the bar, the outside strings are pulled tight, while either hand can be lifted from the ball by pulling the inside strings. A skeleton, the bones of which fall apart at will, requires more strings than usual (Fig. 4). The No. 1 strings support the body and are attached to the shoulders, then passed through small screw eyes on each side of the skull to prevent the head from turning; No. 2 strings control the legs; No. 3 strings control the hands; No. 4 strings are fixed to the top of the arms and passed through holes in the collar bone; and No. 5 strings are attached to the top of the legs and passed through small holes at the hips. The No. 6 string is fixed to the top of the skull by means of a small screw eye, and passes through another small screw eye in the controller A. Then it is tied to a ring, button, or small piece of wood that may be easily grasped. Figure 5 shows a side view of the skull. The jaw is separate from the rest of the skull and is held loosely in place by a small screw at each side. A vertical hole halfway through the skull allows it to rest on top of the spinal column. A suitable hole is made with a red-hot wire just large enough for the string to pass through, the string being fastened to the top of the spine with a small screw eye. By shaking the skull slightly, the jaw is made to move as though chattering. The skeleton can be danced around the stage, suddenly stopped, and the head lifted out of sight into the flies by pulling No. 6 string by the ring. If the controller B, to which the No. 4 and 5 strings are attached, is lowered, the arms and legs fall away from the body. They can be made to do shivering, shaking movements in mid-air as far away from the body as the length of the strings permit. When these evolutions are finished, the limbs join with the body again, the skull falls down on the spine, and the figure dances off. Make the marionette dance over the stage in a low light against a dark background. By alternately raising the ends of B, the skeleton waves its arms and legs about. Pull up the center string that supports the head so it will float and then drop it back into place. The ribs, feet, hands, arms, and legs are made of firm cardboard. The jaw can also be made of cardboard, and the rest of the head and figure carved out of wood or cork. If the entire head is made of wood, the jaw will click as it shuts. 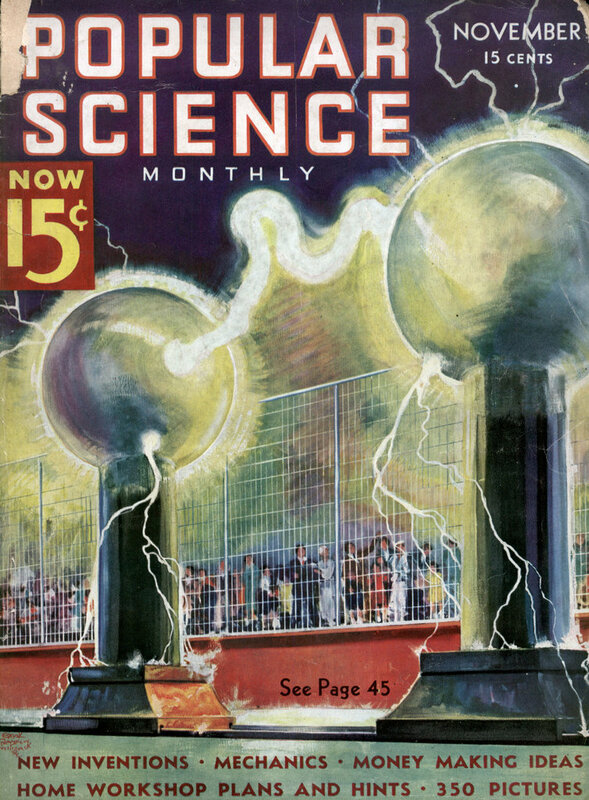 The ribs can be made of covered wire if that seems easier to do. Several coats of dead white paint are needed, and luminous or phosphorescent paint may be used, if desired, to give a still more uncanny effect. It is unnecessary to have this figure anatomically correct; instead, strive to make an effective, entertaining puppet. An amusing figure called the “giant dwarf” is shown in Fig. 6. There is no body inside the costume except the shoulders. The strings attached to controller A pass through screw eyes in the shoulders, are drawn through the costume, and tied to screw eyes in the feet. From controller B, strings are attached to the head behind the ears and a second set to the hands. The feet are cut from wood and at each heel a lead dress weight is held in place by a screw eye. These are covered with two disks of felt, and the trousers . are then sewed to the felt to hold them in place. a jack-in-the-box. A box, large enough to hold the figure when dwarfed and gayly painted, has a string attached to the front of the lid. Pulling this string lifts the lid, and out jumps the dwarf, who can be made to hop about in an engaging way and suddenly loom up as big and important as a giant. The head of the clown (Fig. 7) is hollow, being made like a mask. It reaches only a bit below the mouth so as to leave a large opening. This permits free movement over the point of the throat, where there is a screw eye through which a wire passes. It is looped back of each ear as shown. Whenever a puppet’s hand must be drawn to any special place, an extra string is usually passed through the hand and through a hook or ring at the desired spot. To place hands on hips, akimbo, sew a small metal ring to each hip (Fig. 8). Tie one extra hand string to the tips of each hand, not through the palms, run it through each ring, and draw it up above the controller. Let the hands hang straight down at the sides and tie the strings together. Put a thumb tack in the center of the main rod and slip the string over this when not in use. When this loop is raised, the hands will fly to the hips. When the regular hand strings are raised, they will fly out again. On the same principle, a gallant may be made to put his hand on his heart as he bows, by attaching a ring to his chest and passing the hand string through it (Fig. 9). A deaf man will cup his hand behind his ear if a ring or screw eye is placed to direct the movement (Fig. 11), and a child appears to be crying if his hands are brought up to the eyes (Fig. 10). One of the photographs shows a knight drawing his sword from its scabbard. A string passing through a hand and attached to an object will draw it out, as in this case. In the same way, a handkerchief can be pulled out to wave as occasion demands. TWO scenes from Alice in Wonderland are shown in the photographs. Alice may be made to “open out like the largest telescope.” If you already have a modeled head you can use, just glue a strip of firm cardboard around the throat, paste muslin over this, and paint a flesh color. Cut a piece of soft white fabric to fit the body and nail it to the shoulders, tapering it to fit the throat above and making a small turnover for a collar. Glue or paste this around the cardboard and drive in a few tacks for extra security. Tie an extra string to a screw eye driven in the top of the head and attach this to the center of the stick that controls the strings fastened near the ears. This string must be longer than the others; in fact, very slack so that the head, when loose, will drop down on the shoulders in a natural position. By lifting the string, the neck will be elongated. The famous Scaramouch is often shown with this extension throat. Father William appears in one of the photographs showing his son how young he is by standing on his head. This stunt is performed by attaching a string to each heel and tying these to an extra control stick. If an airplane control is used (Fig. 12), drive a nail through stick No. 1 just back of No. 2 to hold the regular leg stick, and one just in front of No. 2 for the heel stick, so it can be slipped over the nail when not in use and thus be out of the way. 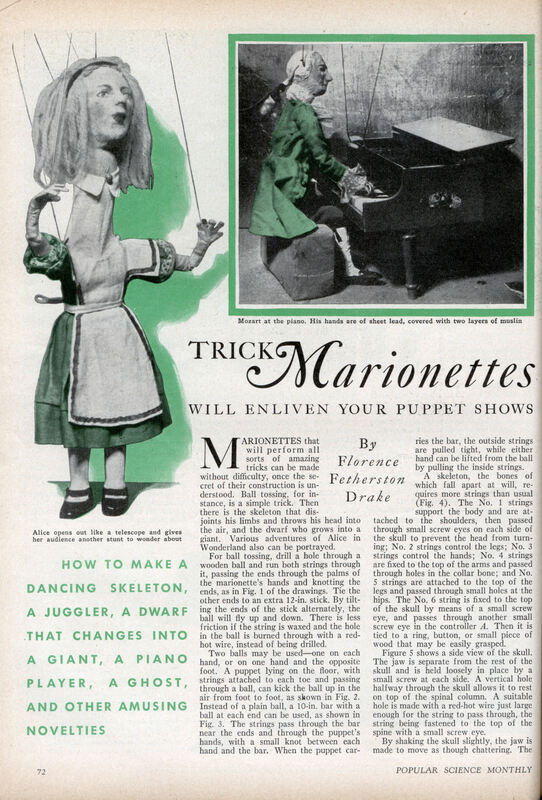 The marionette piano player shown in another of the photographs is made exactly like those described in previous articles in this series (see note at end of this article) except that the hands are made more carefully to fit them for pounding the keys. The hands from the wrist down are of sheet lead, each finger and thumb cut separately; then the hands are covered with two layers of muslin, glued on. Between the first and second layers, the hands are built out a bit with cotton to give them the required thickness. They are attached to wooden lower arms with wire loops, which should have muslin glued over to form a hinge. Finally the hands are given a coat of flesh-color paint. Draw the hand strings through the center of each palm and bend the lead fingers at an angle to the middle joint so the hammer touch can be given. In manipulating, it is important for the puppet to sit firmly on a bench or stool. Ghosts and phantom figures, made as suggested in Fig. 13, are always entertaining. Fine copper wire is used to form the framework for the head. Two pearl beads are strung on the wires to form eyes, and the back of the head is covered with a triangular bit of orange-colored cellulose. A square piece of chiffon or some other diaphanous material is folded to form a triangle, the middle part being attached to the head. Wire-covered hands are sewed to the two upper points halfway from the throat. Only one controller is needed. Alice is the spitting image of a young Margaret Thatcher! I hadn’t noticed it but, yes, she sure is.